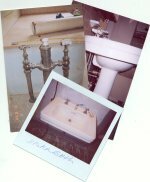 Thank you for considering Bathroom Machineries for your restoration project. Take photos of the valve or fixture, preferably both before and after it is removed. Photos serve several purposes: They allow us to give a very general estimate of rebuilding costs before the fixtures are actually shipped; Photos are helpful during the restoration and reassembly processes, and can answer questions about orientation and application much easier than written descriptions; Also, in the unlikely event that your fixture is damaged in shipping, they provide credible evidence for a freight insurance claim. Step 2: Remove the Fixture. If you have purchased your valve or parts separately from your fixture, make sure that the valve will work on your fixture BEFORE sending it to us for restoration. We have had many instances where customers have sent us valves they thought would fit their fixture only to find out otherwise after paying 100’s of dollars for the restoration of items they ultimately couldn’t use. We can only fix what you send us, we usually can’t determine suitability for your application from afar unless we have the ENTIRE valve AND the fixture it is to be mounted on. A picture is worth 1000 words! Take a picture of the fixture after it is removed. All of the parts you plan on shipping to us should be shown. If you are keeping parts that do not need to be restored, please note this on the photo. The parts may be assembled or disassembled as shown in this picture. When your valve or fixture is received, we can compare what is in the box with your photo. NOTE: If you are for some reason unable to take photographs of your valve or fixture, we will photograph them when they arrive in our shop. Photos are not 100% necessary but it is strongly recommended that you take the time to properly photo-document your project. “Drip Stopper” Treatment. Repair leaks, do not restore appearance. Or anything in-between. You tell us what you would like done, we’ll call you with an estimate and outline the options. Be SURE to include your contact information in the shipping box. The number of packages we receive with no name or phone number inside is simply unbelievable. Packages that arrive without contact information or a completed worksheet will literally be placed in a corner and ignored until someone calls to inquire. You may wish to hire the services of a professional packing and shipping company. All parts should be individually wrapped in paper, foam, or bubble wrap. Small parts should be placed in an envelope or plastic bag. If you are sending more than one fixture, wrap or box them separately and label them “west bathroom” or such. Be sure to fill out our restoration worksheet and include it in an envelope inside the box, or include a detailed note. Please: do not assume that we will remember the details from a previous phone conversation! We receive several fixtures per day and cannot possibly recall all the details for each one. Fixtures that arrive without proper documentation (photos, worksheet, detailed note, etc.) will be given lower priority than those that do. Be sure to purchase ample package insurance, keep in mind that if your fixture were easily replaceable, you wouldn’t be sending to us! Click HERE for convenient printable shipping labels. Feel free to call us at (209) 728-2031 or use the email button at the bottom of this page and we will be more than happy to discuss your restoration project with you.